The Wheelabrator Putnam ash monofill is a regional commercial facility that has been operating since 1999. 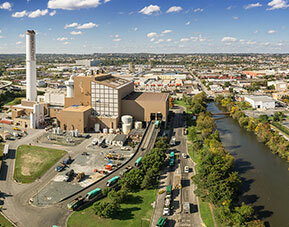 The 9 million cubic yard facility, originally conceived to accommodate and dispose of ash from all of Connecticut's waste-to-energy facilities, receives over 700,000 tons of ash per year from several in-state and out-of-state waste-to-energy plants. The nearly 200-acre facility is located on properties owned by Wheelabrator Putnam and the Town of Putnam and is a model for a public-private partnership. There are nearly 60 acres of permitted disposal cells, built sequentially throughout its life. Recent years feature innovative, proprietary Inashco technology to extract recyclable metals from the ash prior to disposal. All wastewater generated by the site is collected and treated at the Town of Putnam Water Pollution Control Facility. Environmental conditions are monitored by an extensive network of groundwater wells and surface water collection stations.